How do we rise above anger and self-doubt to achieve our most deeply held goals? 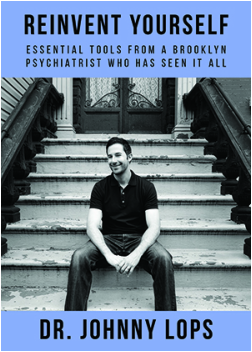 Countless writers have tried to answer this question—perhaps none with more searing honesty than Dr. Johnny Lops, a respected Williamsburg psychiatrist whose refreshingly no-nonsense and humane approach to personal and professional achievement draws on his own colorful experiences growing up in blue-collar Brooklyn during the 1980s and 1990s. Witty, funny, and sometimes disconcertingly frank, Dr. Lops takes us back to his obsessive, anxiety-ridden childhood (complete with twelve-year-old neighborhood tough guys); his disastrous early dating experiences; and the process of self-discovery that enabled him to become a professional actor, doctor, and amateur marathon runner. In this vividly written and engaging book that is part memoir and part instruction manual, Dr. Lops offers eleven simple, practical, and effective tools for maximizing our performance potential and regaining control over our lives. comments about different ways of interpreting events. USNews.com - Why Young People Are Having "Quarter-Life Crisis"